The Art Multimedia Club provides a unique opportunity for students to learn how to create multimedia presentations utilizing the latest in high tech computer programs and equipment. This organization was established to insure that the students of Ursuline High School would be prepared for the future of multimedia presentation that exists in today’s technologically advanced world. It is open to all interested students. 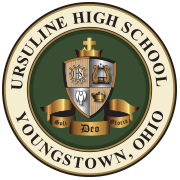 The Ursuline High School Band provides numerous ways for students to perform and showcase their musical talents. The marching band performs at football games, pep assemblies, band nights, OMEA state sanctioned competitions, parades, and basketball games. During the second quarter, the marching band segues into concert band and performs for the annual Christmas Concert and late Advent Prayer Service. During the second semester, the band functions as a concert band. Their talents are showcased during the Fine and Performing Arts Assembly, the annual spring concert, awards day, and competitively during the annual spring trip. Past trip destinations in which the band has earned numeroud competitive awards and honors include: Virginia Beach, Myrtle Beach, Atlanta, Cincinnati, Chicago, Orlando, St. Louis, Hershey, Toronto, and Gaitlinburg. Aside from performing in major music ensembles, students also have the opportunity to participate in numerous smaller ensembles that include: OMEA Solo & Ensemble competition, Stage Band, Percussion Ensemble, and Drummawockeez. Students also receive recognition at the annual awards banquet held each spring. The colorguard is an important visual segment of the marching band during the first quarter of the year. It is one unit comprised of flags, dance, and majorettes. The colorguard is open to students in grades 9-12 and members are selected after an extended audition process. Members have the opportunity to perform at football games, band nights, pep assemblies, OMEA state sanctioned competitions and parades. The International Thespian Society, the student division of the Educational Theatre Association is the world’s largest honor society for theatre arts students. Ursuline High School troupe 5185 encourages students to attain a better mastery of the theatre arts and reqards those who achieve standards of excellence. Each year, Ursuline produces four theatrical productions: two musicals, a non-musical and the student-directed one acts which have become a favorite Ursuline tradition. Auditions for all productions are held for casting purposes. Students not wishing to appear on stage serve in backstage capacities (e.g. set building, running lights and sound, stage management). Any Ursuline student can be a member of the Drama Club or Apprentice Thespians by attending meetings and participating in Ursuline Theatre productions. Those students who desire to be inducted into the International Thespian Society earn points based on their participation in Ursuline Theatre productions and activities. The Liturgical Choir is open to all students who wish to share their musical talents thereby enhancing the quality of our liturgical worship. The group welcomes all whom wish to participate but particularly those who can play a musical instrument and those who enjoy singing. Choir practice will be held weekly. The Speech and Debate team participates in forensic competitions at the local, state, and national level. Categories include: Oratorical Interpretation, Original Oratory, Humerous Interpretation, Dramatic Interpretation, U.S. and International Extemporaneous Speaking, Prose-Poetry, Duo Interpretation, Impromptu Speaking, Lincoln-Douglas Public Forum, and Congressional Debates. Students receive coaching during the months of September and October and compete during the months of November through March. Competitions are usually scheduled on Saturdays. The team is affiliated with both the Ohio High School Speech League and the National Forensic League. Practices are held after school at least 2 nights a week during the Speech/Debate season. Any student may become a speech and debate team member providing he/she completes team responsibilities and follows team policies and regulations.